Over the years, Jon Dixon has accumulated a number of types of Sinningia leucotricha. We show some here. This picture, taken May 28, 2007, shows the venerable plants of Sinningia leucotricha on Jon Dixon's front porch in Woodside, California. Jon says there are three old tubers in a big terracotta urn (visible in the picture). On this day we counted twenty blooming stalks. He protected them from damage during the January 2007 freeze by throwing a towel over the entire assembly. Not visible in this picture is Jon and the towels he was trying to fling in a targeted manner over the shade cloth in order to permit me to get a reasonably good picture of his plants. We will all be relieved to hear that he survived the operation without damage. This plant, which Jon calls the "Max Dekking" clone, after the renowned San Diego grower and breeder (especially of episcias), is distinguished by its attractively hairy flowers. It also usually has more than one tier of leaves and blooms, which is relatively uncommon in "normal" leucotrichas. 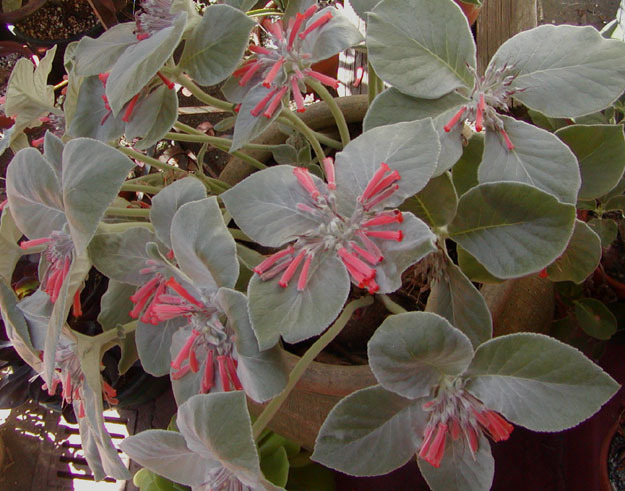 Jon also has a plant which he calls Sinningia 'Doris' (after the late Doris Cormier, one of the long-time members of both the San Francisco and Peninsula Gesneriad Societies), which appears to be either an unusual form or a very old hybrid of Sinningia leucotricha. One of its striking features is that its flowers are dark red instead of the normal leucotricha pastel. 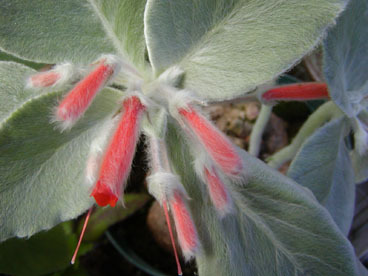 Jon exhibited this plant at the 2003 Gesneriad Society convention in Sacramento; the Society's web site has a picture.